First visit in June this year it's as near perfect as you can get.We were lucky with the weather. The wood behind the van was a carpet of bluebell. The famous Tralee chip van is next door a treat for the first night. Duncan is a true Highland host makes everyone welcome. We loved the fact it is also a working croft. We had planned a second visit but had to cancel.we will return in the Spring. Planned to stay 4 days and stayed 6! Site lovely position looking out to the sea. Well cared for facilities and Duncan welcomes and looks after you. Extra's like small tables for your stove provided, as well as a cooking hut if the weather is bad. Would return, especially as no midges! 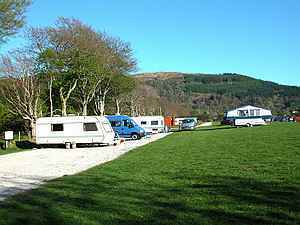 Add your review to Seaview Caravan and Camping Park with the form below. My partner and I visited the Seaview site in July 2010 for a three night stay. We were looking for a relaxed break away from the city life.This site was ideal for that. We arrived and the welcome was great, the owner was very welcoming and guided us to out pitch which looked out onto an amazing view to the isles. The facilities were perfect for anyone's needs, very clean and well kept. You always saw the owner out and about checking and chatting to visitors ensuring everyone was okay and happily answering any questions. A highly recommended site for couples and families needing a break for the hustle and bustle.Well worth a visit. Great location, close to beach. Small campsite which was fairly quiet when we went. (late june) Nice to have an actual "bathroom" to shower and change rather than a cubicle! No facilities for kids on site (good for us with no kids) but there is a play area near the beach. Also good for us big kids to play on the zip wires! Just turned up here on spec and am glad I picked this campsite. Wasn't too busy for the two nights I stayed, only a couple of other tents and about ten caravans. Evan if it was busier I think the field is large enough that you wouldn't feel crammed in. All the facilities were there that I needed- toilets, showers and washing area. Some of the showers needed 50p pieces and some didn't. The washing up room also contained some maps and tourist information on the area. It is only a short walk into Benderloch where there is a good shop and a cafe which I didn't go to. You can also walk back to the site along the beach. It is a family run site and they were all very friendly and gave some good reccommedations on where to eat and what to do in the area. Really enjoyed my stay and will hopefully go back. Fantastic wee campsite which we just happened to stumble upon while travelling the west coast. Violet, the owner , a lovely lady, made you feel very welcome. Facilities are ok, very clean. Really laid back site, perfect for sitting with a beer watchiing th sun set. Small peaceful site in a great situation near the beach. Facilities a bit antiquated but somehow this suited the site. Pitching is mixed with some of the ground a bit lumpy but it is essentially a field after all. The site is quite small but if you are looking for a site next to the beach its perfect. When we were there there were some rope swings tied to a couple of trees nearby. The karting is also nearby. The beach is just down a small lane about 50 yards away. The prices for camping was very reasonable. Showers were okay although when you were accessing one of the shower blocks it was a bit marshy. I would also say pick your tent pitch carefully as the ground seems to get quite marshy in parts of the site when it has been raining a lot.